Ok...I really had to fix this one. This was a copykat recipe from the Cheesecake Factory which I had recently. Of course it didn't come anywhere near what I had. That's what I get for being a copykat...nah nah nah nah nah! I think Chef Pablo is not giving away anything! 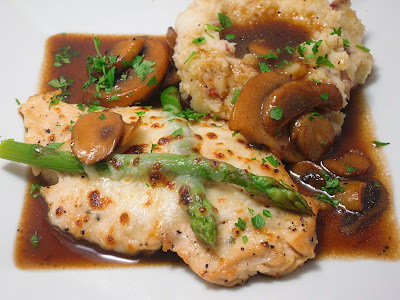 This is a sauteed chicken topped with asparagus and melted cheese. All topped with mushrooms in a Madeira wine sauce. Served with a generous portion of mashed potatoes. I'm giving you the recipe as I found it....with my changes. Cover chicken breast with plastic wrap; pound to 1/4-inch thick. Sprinkle each chicken breast with salt and pepper. Heat 1 tablespoon olive in frying pan over medium high heat. Saute breasts 4-6 minutes per side until done and browned just a bit. Remove from pan and wrap in foil to keep warm while you make the sauce. In the same pan that you sauteed the chicken add 1 tablespoon olive oil and add sliced mushrooms; saute for about 2 minutes. Add Madeira wine, beef stock, butter and pepper. Bring to a boil then reduce heat; simmer 20 minutes until reduced to about 1/2 original volume. When sauce is done it will be thick...............this did not happen. I reduced it an additional 20 minutes and it did not thicken. I added 1 tsp. cornstarch with a little water..A little better. This was a very sweet sauce. The dish I had tasted more like a beefy barbeque sauce. I added the following: 1 tsp. Worcestershire Sauce and 1 tsp. Jack Daniels Spicy Original Barbeque Sauce. This came close to what I had. While sauce is reducing, bring a pan of water to a boil. Add salt to water; blanch asparagus 3-5 minutes and drop into ice water to stop cooking. Set oven to broil. In baking dish arrange chicken, cross 2 asparagus stems over each piece of chicken and top with a slice of cheese. Broil until cheese melts. To serve, top with 3-4 Tablespoons sauce. It's a lovely presentation and very easy to make. I love that place to eat! This looks spectacular. I can just imagine how much better homemade is! I love the presentation its awesome! Oh yeah a new chicken recipe! This sounds and looks superb Patti. Your photos are crisp and DEElish! Hubby and I love chicken. I'm always up for a new recipe but him, well he's not usually keen on first word of it but has yet to complain about any one of them! men!! Glad you gave us the tweaked recipe! I usually have the same issue when I do the copykat recipes..lol. But you feel like you at least gotta give it a try. You did great with your changes. Wish I could have a bite right off the screen! Well, I think anything with mashed potatoes will be perfect. What time is dinner?